Temperatures are looking up and the thoughts are that we are out of the coldest spring weather! Daily high temperatures are above 55 degrees for the foreseeable future, and lows are not expected to be below freezing. Now seems like the perfect time to repair your lawn by removing dead patches and reseeding the bare spots. What we recommend… Walk around your lawn, rake out dead patches and mow, if needed. After these steps, you will have a good idea whether you need to seed or not. If spots are over a couple of inches in diameter, you will want to loosen up the soil in that area before you sprinkle down the grass seed. If the soil is poor, you will want to consider putting down some fresh top soil (or lawn soil) on the top layer before seeding. 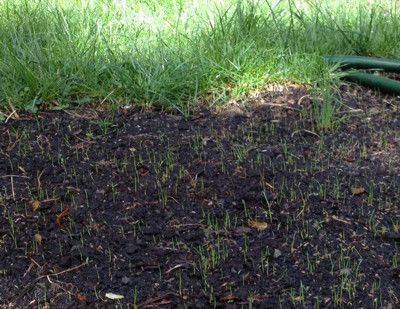 It is important to have seed-to-soil contact, so be sure to remove dead grass and thatch from those areas so that the seedlings have a good nutritious soil to get started in! If the lawn is thin… We recommend overseeding with a grass seed recommended for the sunlight conditions that your grass receives in that area. Overseeding is when you broadcast seed lightly over large areas and the seed helps to feel in the gaps. Lots of grass varieties don’t naturally thicken quickly, so the addition of more grass seeds is often the quickest way to thicken your turf. We also would recommend coinciding overseeding with an application of new seeding (starter) fertilizer to promote quick germination and fast root development. For more specific steps on seeding, please view our prior Blog post, seen here.